We are in the business of ensuring the best available groundwater for you.. The unfortunate reality is ground water can be influenced by surrounding geological rock formations that contain soluble minerals. On its way to your well, water, the universal solvent, picks up those soluble mineral characteristics that show themselves as stains, solids, odors and crust to name a few. Water quality (or quantity for that matter) cannot be easily predicted before a well is drilled. 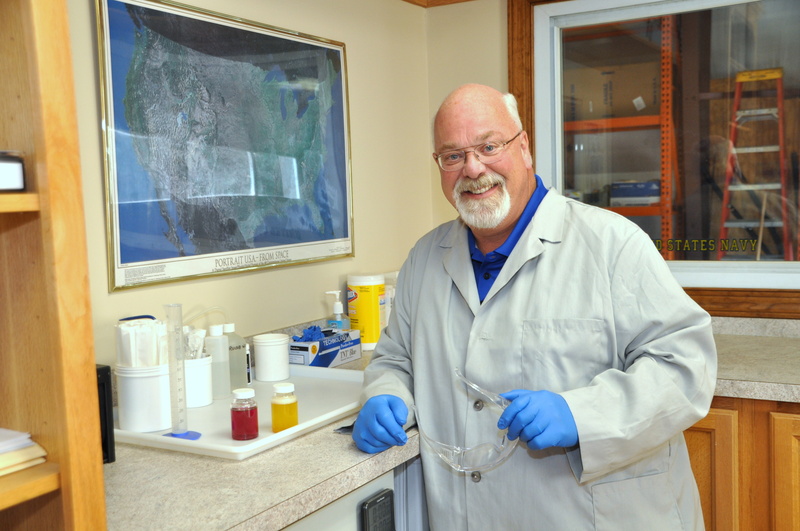 Many well drillers may leave water quality to the unsuspecting user, Curtis Drilling feels obliged and therefore maintains an on-site water testing lab dedicated to timely accurate results. For best results and conclusive testing, the well should be allowed to operate under its expected load for about a month to determine the water’s truly represented aesthetic properties. Our lab is staffed with people that can accurately identify the well water chemistry problems and more importantly provide effective treatment options should they be needed. The long and short of it is, we will provide you the right solution from our problem solving approach instead of a “sales pitch” about what we have in stock. We also offer microbiological Coliform and e.Coli. water testing for State Well Certification. Please check these pages for more information about water testing and treatment.